1. Rectangular tray design makes it stable and outstanding from others. 2. The plates have a lip all around the edge to prevent food runaway. 3. White color - White color can go with any decoration, very elegant. Idea for tea party or daily use. Great for holidays, entertaining, birthday party, tea party or everyday use. It is a practical cupcake stand to hold small desserts such as sliced cake, cookies and fruits. You could have it on your breakfast table and put all kinds of fruits so that kids can just grab them and eat them instead of opting for junk food. Diameter of Platter: bottom tier - 12.9 inch, top tier - 13.8 inch. Will hold 12-14 cupcakes or lots of finger foods. It is packaged well in a gift box, a great gift for Christmas, Birthday, Wedding Party, or just without any special reason. Porcelain is made from kaolin clay. It is fired at temperatures in excess of 1,300 degrees Celsius and is fully vitrified, which makes it much sturdy than stoneware. Porcelain is generally white, gray or cream colored. It is smooth with a more delicate appearance. Porcelain ware is resistant to chip and get stain, dishwasher and oven safe. Without containing any chemical, they are non-toxic, healthier than other materials. STYLISH DESIGN - Rectangular tray design makes it stable and outstanding from others. 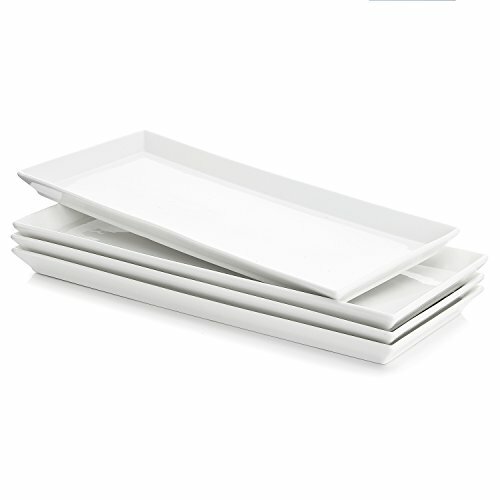 The plates have a lip all around the edge to prevent food runaway,and could be used as serving trays. And white color fits all decorations and is a timeless classic. FUNCTIONAL & STYLISH DESIGN - Rectangular tray design makes it stable and outstanding from others. The plates have a lip all around the edge to prevent food runaway. White color fits all decorations and is timeless classic. LARGE FOR VARIOUS FOOD -The plate is large for displaying a lot of desserts such as cupcakes, cake, cookies, fruit, vegetables and other pastries. Idea for party, gathering or daily use. DIAMETER OF PLATTER - The size is 12.9 x 5.7 x 0.8 inches. Will hold 12-14 cupcakes or lots of finger foods.